Lord Brahma, Lord Vishnu & Lord Mahesh(Shiva). 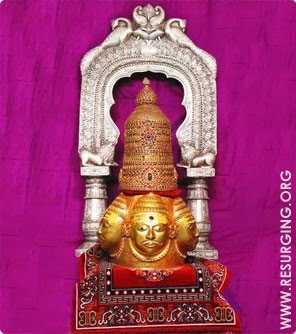 All other Jyotirlingas have Shiva as the main deity. The temple is known for its appealing architecture and sculpture. 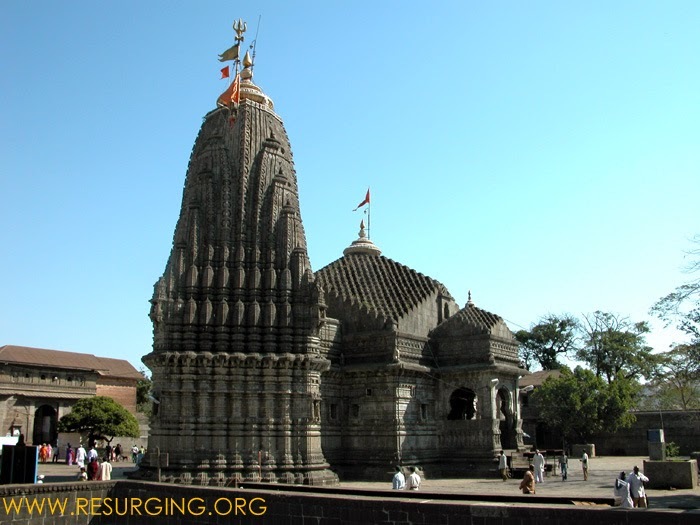 There are two stories related to Trimbakeshwar. One story is about Simhastha Parva according to Padma Puran. Centuries ago the gods and goddesses used to roam in India. They helped sages and people living here at the time of various difficulties, especially from the demons who were a nuisance. However, this fight generally caused heavy damages to both, gods and demons. It was decided to settle the issue of supremacy once for all. They agreed that whosoever captures Amritakumbha (immortal nectar) will be the victor. Amritakumbha (pot with immortal nectar) was on the sea bed. to know of this, they launched a violent fight for Amritakumbha (immortal nectar). In process drops of nectar fell at four places - Haridwar, Prayag, Ujjain and Trimbakeshwar. Trimbakeshwar is one of the four places where drops of heavenly nectar fell. At that time was when the planet Jupiter (Guru) had entered the hemisphere of Leo (Simha). And as this same planet enters the hemisphere once in 12 years, the Kumbh Mela is held once in 12 years in the respective areas. The other story is equally interesting. Sage Gautam used to live in this area. Once there was severe drought for 24 years. To come to the rescue of people, sage Gautam worshipped Lord Varun (rain god) and the god was pleased. He blessed the sage with the gift of plenty of rains in the area. This made the area lush green and full of water. But this made other sages jealous of Gautam. They sent a cow to destroy the granary of Gautam. When Gautam tried to shoo her away, she was injured and died. Waiting for such an opportunity, other sages charged Gauam of great sin of killing mother cow and made him go for penance. He was asked to worship Lord Shiva and bathe in Ganga. It is said that a devotee who wants to perform puja should bathe and enter the main enclosure in wet dhoti. But it appears that it is not followed strictly. One can manage this by paying some money to Rs 150 or Rs 200 to the priest as advance Dakshina. There is no fixed rate structure for puja here as in the case of other jyotirlingas. It all depends on the deal a devotee strikes with priest. 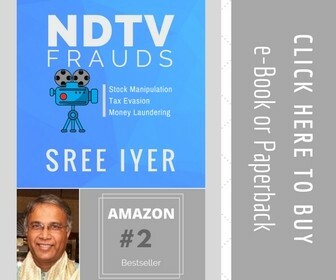 Still it is in quite affordable range of Rs 101 to Rs 151. All pujas are performed at sabhamandap or small hall inside the main temple. Nagbali-Narayan Bali-Kalsarpa dosh Puja - Trimbakeshwar is the place where many pilgrims come to perform a special puja called Nagbali-Narayanbali and Kalsarpadosh nivaran. The devotee who is childless come at this place and performs this puja, which takes 3 to 4 hours.The purohits normally charge a minimum of Rs.2000. The charge depends upon the scale and capacity of puja and the pilgrim. Nagbali -Narayan bali puja is performed for one's forefathers. The puja is performed at the place called Sangam (confluence) of the Godavari and its tributary Ahilya, which is just outside the Trimbakeshwar temple. The pujas are performed daily during the morning hours. 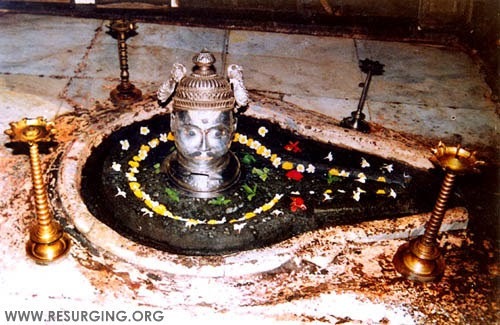 Temple is managed by Shri Trimbakeshwar Jyotirlinga Trust. However, pujas are controlled by purohits .There are three main pujas performed every day. 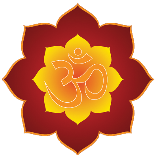 Pujas are between 7 to 9 am, noon puja at 1 pm and sayam puja between 7 to 9 pm. During the night worship, sheja arti is carried out and a silver mask placed on a bed in a hall of mirrors. Every Monday between 3:30 and 5 pm, a palki (palanquin) carries the silver panch mukhi mukhota (five faced image of Lord Trimbakeshwar) from the temple complex to nearby Kushavrata Tirtha and back. An abhishek is performed there. The palki processions carry a golden crown during Shivaratri, Kartik Purnima and Dussehra. The special golden crown of the Lord donated by the Peshwas is also shown to devotees once a week on every Monday at 4:30 pm. Kushavrata Tirtha: Kushavrata Tirtha is a main place of pilgrim attraction during the Simhastha Kumbha mela. Devotees come to have a bath in this holy pond and become free of results of their sins. It is just 200 meter away from main Trimakeshwar temple complex. Today's structure was built by Bala Saheb of Holkar regime in 1690-91 at the cost of Rs.8 lacs.I t's a beautiful example of sculpture with graceful look. All around the tirtha are temple shaped tombs. The golden pot at top of the temple was donated by Anna Saheb Vichurkar. The importance of this place is that the Godavari river descends from its origin in the Brahmgiri Hill and merges into the Kushavrata Tirtha.The Kedarnath temple is on the southern end of this pond. The temple has some exquisite carvings depicting the forms of Lord Shiva. Most devotees take a dip in the pond which is 21 feet deep but shallow near the steps. Behind the Kedareshwar temple there is a place to change the clothes for ladies. The tirtha remain opens 24 hours. Bilwa Tirtha: Bilwa Tirtha is situated to the north of Neel Parvat. There is a temple of Bilvakeshwar Mahadev. Gautama Tirtha: Gautama Tirtha is to the south of the Ganga and the Trimbakeshwar temple. God of water Varun was pleased with Gautama and he gave this tirtha as a permanent source of water. To the north is Gautameshwar and to the south is Rameshwar Mahadev. Indra Tirtha : Indra Tirtha is to the east and near Kushavarta. This is known as Shakra-Kupa for Indra wiped off his curse given by sage Gautama for enjoying Ahilya, by a bath in this tirtha.. On the bank of the tirtha is a beautiful temple of Indreshwar Mahadev with an idol of Indra seated on an Airavata elephant. Ahilya Sangam tirtha : There is an interesting story about this thirth. It is said that a friend of Gautam took the form of Gautam's wife Ahilya. He approached Gautam to end his penance. But Gautam detected the game plan and he cursed his friend Jatila to turn into a river. Shocked by this , Jatila asked Gautam to take back his curse. Gautam did and told Jatila that he would be free of his curse This is the Ahilya-Sangam tirtha where Ganga and Godavari join. Sant Nivruttinath Samadhi Temple: The place is 2 km away from Trimbakeshwar temple. It is the shrine with a narrow colourful dome houses the samadhi of Sant Nivrutti Nath. He was the elder brother of Maharastra's most famous saint Dhyaneshwar. Nivrruttinath was the first to achieve sainthood in Varkari Sampradaya and he guided all his three siblings. The place remains open between 5 am tand 10 pm daily. Neel Parvat: Neel Parvat is located in the north of the Trimbakshwar city and it is one of the five major pilgrim places. The visitors normally comes in the late afternoon or early morning to visit this place.The 200 steps climb takes 45 minutes to one hour.If one can not climb the mount,ther is also an option to hire an auto rickshaw for Trimbakeshwar temple-Neel Parvat round trip and it charges around Rs.60 to Rs.75. It's a walking distance from the Trimbakeshwar bus stand. Brahmagiri Hill: Climbing the Brahmagiri Hill which is 4248 feet high is also a must do for the mountain lovers when they visit Trimbakeshwar.It is 2.5 km north of Trimbakeshwar Temple.Original Ganges and Trimbak Tirtha are on Brahmagiri mountain adjacent to Trimbakeshwar temple. Brahmagiri is considered as a huge form of Lord Shiva and hence the mountain climbing was considered as a sin. However in 1908 Seth Lalchand Jashodanand Bhambhani of Karachi and Seth Ganeshdas built 500 steps of stone at a cost of Rs. 40,000 then. This has facilitated easy access to Brahmagiri. Here river Godavari is flowing in three directions on the mountain. The one flowing towards east is called Godavari, one flowing towards the south is called Vaitarna and the one flowing towards the west is called the west-flowing Ganga and meets Godavari near Chakra Tirth. The first peak of Sahyadri is called Brahmagiri. The story associated with this is that Lord Shiva was pleased with Brahmadev and said that he will be known by name of Brahmadev. Hence it is called as Brahmagiri. The Five peaks of this mountain are called Sadyo-Jata, Vamdev, Aghora, Ishana and Tat-Purusha and are considered as five mouths of the Lord Shiva and they are worshipped. Ganngdwar: Ganngdwar is situated in right of the middle of Brahmagiri Mountain. There is a temple of Ganga, now known as Godavari River. Ganga appears first time here, after it vanishes from Brahmagiri Mountain.There are 750 steps to Gangadwar. They were built by Sheth Karamasi Hansraj of Kutch, Gujarat. The work was commenced in 1907 and was completed in 1918.Sheth Hansraj also built road for the visitors.Gangadwar is one of the five tirthas. There is an idol of Ganga and 108 shivalingas installed by Rishi Gautam.The caves of Gorakhnath is also situated at this place. Gorakhnath Math: The saint Gorakhnath who born in 11th century had established Nath Sampraday or Nath movement.He became well known in India.He showed many miracles of Yoga.He preached to Nivruttinath and granted him the initiation of Nath community.The samadhi temple is near trimbakeshwar temple. Parikrama: On third Monday of holy shravan many devotees undertake parikrama (circumnavigation) of the Brahmagiri Hill.More than 3.5 lacs devotees walk a distance of 30 km in about 6 to 7 hours.Many devotees also perform a 12 km parikrama through different route of Brahmagiri hill in 12 to 13 hours. Swami Smarth Ashram: It is situated about 2 km from Trimbakeshwar Temple.Swami Smarth was a very popular Spiritual Guru in Maharastra in the 19th century .The temple is spacious and clean.The temple faces Sahyadri and Trimbak hence offers a beautiful view. It remain opens all the day. There are good hotels, guest houses and dharmashalas in Trimbakeshwar town. Normally they charge between Rs.100 to Rs.1000 .Yatri Niwas run by Trimbakeshwar trust is also a good option to stay.